Threads are cut by many methods as per the requirement. A few of them are mentioned below. Operator has to select the method depending upon the accuracy required, cost of the job, size of the job etc. (a) Hand Taps and Dies - A common method of threading is cutting with taps and dies. Unlike drill bits, hand taps do not automatically remove the chips they create. A hand tap cannot cut its threads in a single rotation because it creates long chips which quickly jam the tap. 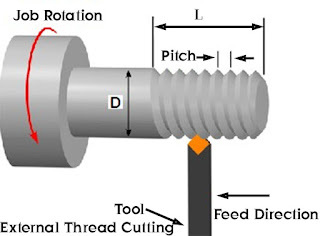 Therefore, in manual thread cutting, normal wrench usage is to cut the threads 1/2 to 2/3 of a turn (180 to 240 degree rotation), then reverse the tap for about 1/6 of a turn (60 degrees) until the chips are broken by the back edges of the cutters. It may be necessary to periodically remove the tap from the hole to clear the chips, especially when a blind hole is threaded. (b) Machine Taps and Dies - For continuous tapping operations (i.e., power tapping) specialized spiral point or "gun" taps are used to eject the chips and prevent jamming. (c) Cutting with Single Point Tool on Lathe - Thread cutting with single-point tool is an operation that uses a single-point tool to produce a thread form on a cylinder or cone. The tool moves linearly while the precise rotation of the workpiece determines the lead of the thread. The process can be done to create external or internal threads (male or female). In external thread cutting, the piece can either be held in a chuck or mounted between two centers. With internal thread cutting, the piece is held in a chuck. The tool moves across the piece linearly, taking chips off the workpiece with each pass. (d) Thread Milling - Threads may be milled with a rotating milling cutter if the correct helical tool path can be arranged. This has been possible mechanically since the early nineteenth century, but it was never a common method of threading until the development of CNC machines. With the development of CNC machines, internal and external threads are often milled. (e) Thread Grinding - Thread grinding is done on a grinding machine using specially dressed grinding wheels matching the shape of the threads. The process is usually used to produce accurate threads or threads in hard materials; a common application is ball screw mechanisms. (a) Before proceeding to cut different types of threads on lathe, the operator should be fully conversant with different terms, types, starts and shape of threads. (b) External or internal threads may be cut on lathe either with the help of a die or tap respectively or a thread cutting tool may be used. (c) A certain relation is needed between job revolutions and revolutions of lead screw to control the linear movement of the tool, parallel to the job length when half nut is engaged with lead screw. (d) The tool should be ground to the proper shape and profile of the thread to be cut. (e) Many lathes are provided with quick-change gearbox in which different ratios of spindle and lead screw revolutions can be readily obtained by simply shifting the gear change lever. In other lathes, for cutting different pitches of threads, every time gears are changed. (f) For cutting threads on a lathe, headstock spindle is connected with the lead screw through gears in such a way that positive carriage feed is obtained and the lead screw is driven at a predetermined speed in relation to the spindle speed. The point of thread cutting tool should coincide with the form of the thread to be cut. The included angle should be same as of thread to be cut. The point of internal thread cutting tool should be square to the shank. In thread cutting there should be certain ratio of motion between the travel of the tool and the rotation of the spindle. This ratio is affected by the lead screw, which is linked to the lathe spindle through gears. Note that the spindle gear is never changed for cutting different pitches of threads. Only the stud gear (driver gear) and lead screw gear (driven gear) are changed whenever a particular ratio is needed between the revolution of spindle and the lead screw. We will arrive at a formula, which can give the required ratio between the teeth on stud and lead screw gears. Usually the range of gears commonly available is from 20 teeth to 120 teeth gears with a step of 5 teeth (63 and 127 extra). 20 teeth and 60 teeth gears have two pieces each to produce threads with same lead as that of lead screw. 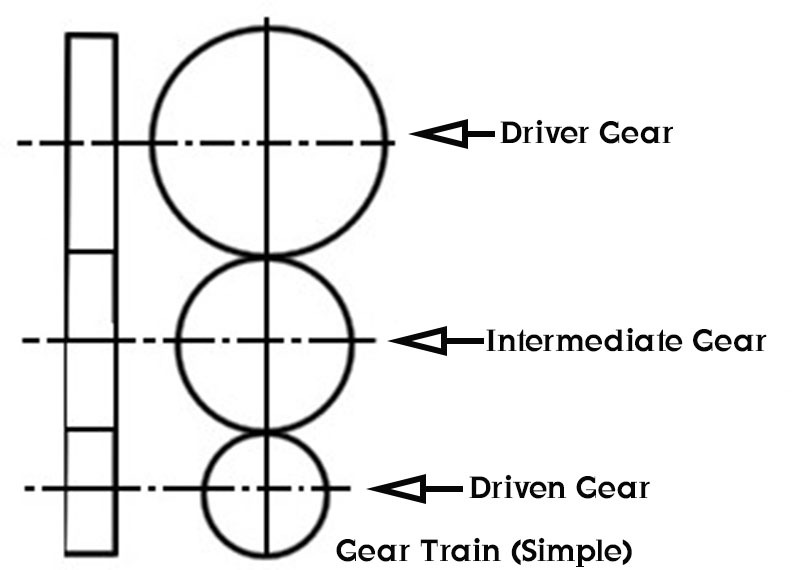 (a) Simple Wheel Trains - It includes only three gears, driver, driven and some suitable intermediate gear, which is used to fill up the distance gap between the driver, and the driven gear. Intermediate gear has no effect on the ratio of the revolutions between driver and driven. A numerical problem will clear the idea as given below. 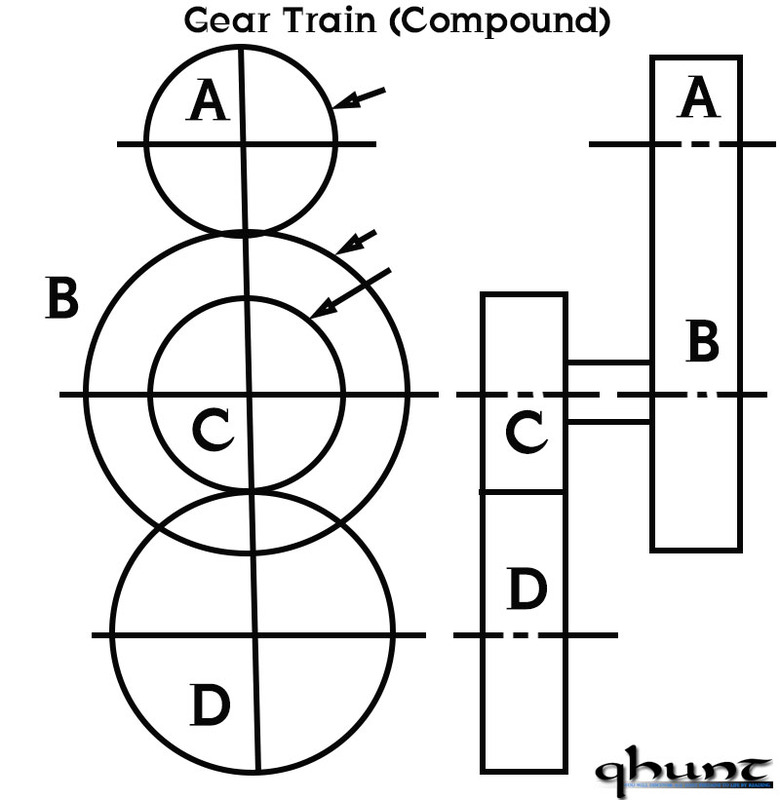 (b) Compound Wheel Train - Sometimes driver and driven gear ratio becomes so typical that the selection of gears to arrange in a simple train becomes difficult. 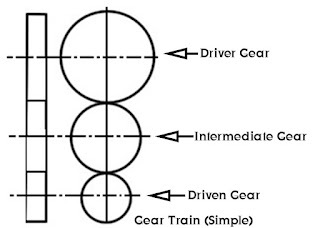 For example Dr and Dn ratio is 4/26, and then a set of gears, which can give this ratio in the simple train, may become difficult. 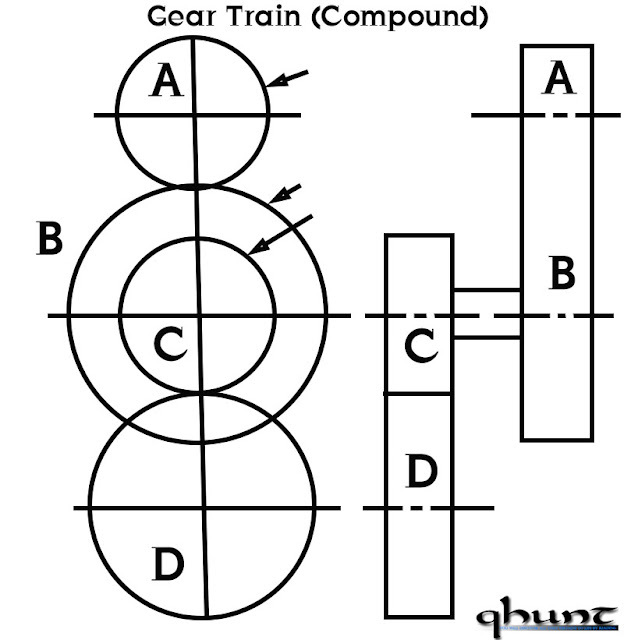 In such cases the solution is obtained with the use of compound wheel train, whose arrangement is shown in figure given below. For cutting external and internal threads, tool should be set to exactly at the centre height and at 90° to the job. Angle gauge is used for this purpose. 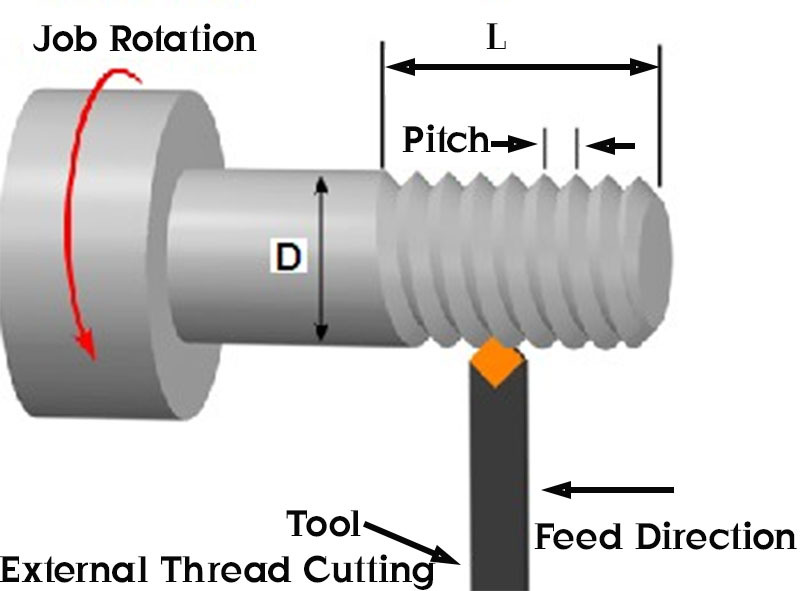 Figure below shows the tool setting for external thread cutting. The tool may be fed exactly 90o to the job axis for external as well as internal thread cutting. In the figure below; Where:D = Diameter, L = Length of threaded portion. Speed of the job while cutting the threads is usually kept as one-third to one-fourth of the job speed of turning operation. Faster speed should be used on soft metals and slower speed on hard metals. (a) At the end of each travel of the tool, take it back from the job surface and stop the machine. Disengage half-nut from lead screw and return it by hand to the starting point of the cut. By trial method, set the tool in right groove, start the machine to have the fresh cut after giving a certain feed to the tool. (b) Do not disengage half-nut from lead screw at the end of each cut. By reversing the direction of lead screw, bring the carriage to the starting position of the cut. A mark may be given on the bed by the side of the carriage; this will help in setting the carriage immediately. This method is useful for cutting threads on short lengths or in blind holes or for threads of odd pitches, which are difficult to cut even with the help of chasing dial method. Hold the job between the lathe centres or in chuck as required and turn it to the size of the major diameter of thread to be cut. Select suitable change gear set for cutting required pitch of thread and arrange them. At the end of job, which will be starting end for every cut while threading, turn a very small step of diameter equal to the minor diameter to be cut i.e. recessing. Set the tool properly, swivel and clamp the compound rest at an angle if required as discussed already. Adjust the spindle speed for threading. Bring the tool at the starting point, take a certain depth of cut and engage the half nut with lead screw. This will move the tool along the job length forming a thread groove. Have few successive cuts to obtain the required depth of thread. That small step turned at the job and will guide you to feed the tool up to a required depth. When threading is complete, stop the lathe and measure the depth of the threads with a thread pitch gauge. Hold the job in a chuck. Make a hole equal to the minor diameter of the thread. A common practice is to make the hole slightly larger than minor diameter of thread for providing a clearance between the mating parts. Turn a small groove at the end of the thread length equal to the major diameter of the thread to guide the operator for maintaining the correct depth of thread. Rest of the procedure is the same as for cutting external threads. By moving carriage, bring the tool to the job front and let it go inside the hole till it reaches the point at, which the last thread will terminate. At this position, make a line on the bed to guide the operator that he is not to allow the carriage to come towards the left ahead of this mark. The method of cutting, square and acme threads is normally the same as that of cutting V -threads except that the shape of the tool is different. These threads are deep and broad and so it is essential to take care while grinding the tool with proper side clearances. The usual practice is to rough-out with V-tool up to the required depth of the square or acme thread and then a proper tool is used to produce square or acme thread. This will reduce the cutting pressure on square or acme tool. It will cut the shoulders V -threads to render them the forms of square or acme type. Square threading tool should be thinner at the bottom and should have its leading angle greater than the angle of following or trailing side. While cutting acme threads, make sure about the required clearances between the male and female thread pieces. The normal working depth in acme thread is equal to half of the pitch. Clearance at the thread crest and root in male and female assemblies is 0.01 inch for all sizes of acme threads. To obtain this clearance, major diameter of internal thread is made 0.02 inch oversize and the screws are cut 0.01 inch deeper to give minor diameter clearance. Direction of rotation of job and lead screw should be same i.e. towards the operator (counter clock wise). For threading on job, start the cut from tail stock side. After engaging half nut, see that the tool moves from the tail stock side to headstock side. Reverse the direction of rotation of lead screw with the direction reversing mechanism lever. Start the cut on job from headstock side so that when half nut is engaged tool should move from headstock to tail stock side. (a) Faceplate of lathe may be divided and marked in as many parts as the starts are to be had on the job. Every mark will give the starting position for new start of the thread. (b) Indexing faceplate of typical construction for cutting multi start threads are usually available. On the plate, means are provided to rotate the job through whatever fractional part of the job circumference is needed. (c) Compound rest is also used for adjusting the tool to have the correct spacing while cutting multi start threads. Set the compound rest parallel to work axis. When one start of the thread is cut, then the tool is moved a distance equal to the pitch to be cut. 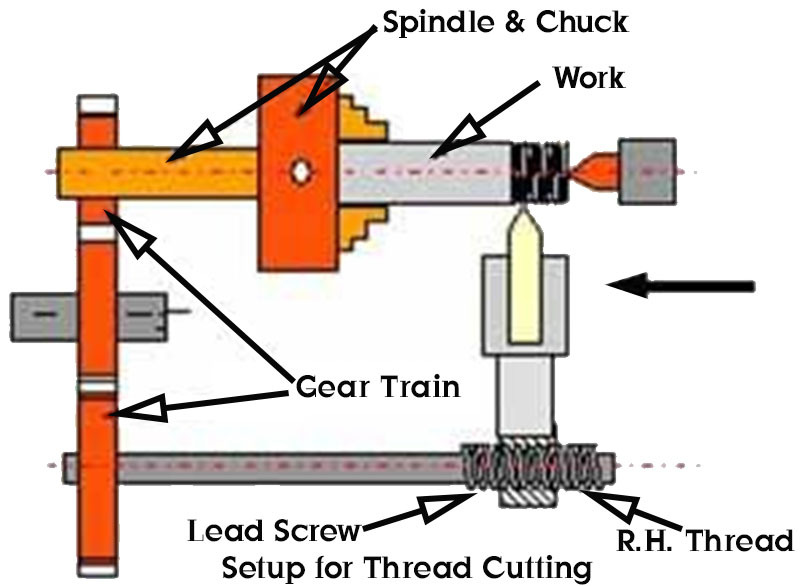 This method is mostly used for cutting internal threads. Make sure that there is no backlash in the compound rest screw. The rest of the procedure is to get the lines of different starts inscribed on the job surface along the length with a thread cutting tool, cut rough profiles of different starts. For finishing the threads, finish first start completely and then one after the other. The only precaution used for cutting threads on a tapered surface is that the threading tool is set perpendicular to the lathe axis and not to the tapered surface. Rests of the procedure is same. Only taper turning attachment is employed for taper turning and thread cutting. It is threading tool with various teeth. It can do threading operation on soft metal quickly in comparison to the single point-threading tool. It can also be used to rectify the damaged thread and also to clean the thread portion. While threading on lathe following defects may occur. (a) Incorrect Pitch - It is due to wrong calculations and selecting wrong change gears. Wrong positioning of gears also results in this defect. To avoid this care may be taken while calculating the change gears and positioning at their proper place. (b) Incorrect Dimensions - This is due to excessive removal of material or less removal of material while turning and threading operation. (c) Incorrect Thread Form - It is due to wrong grinding of tool point or incorrect setting of tool in relation to the work piece. This defect can be avoided by carefully checking the angle on the tool point and its setting. (d) Poor Quality of Surface Finish - Poor quality means scoring and gauging on the thread flanks. It is due to wrong ground tools, excessive depth of cut, wrong cutting speeds, work and tool not clamped properly, lack of cutting fluid and dull tools. This can be avoided by eliminating above causes.